This morning I went short 200 shares COH at $28.10. 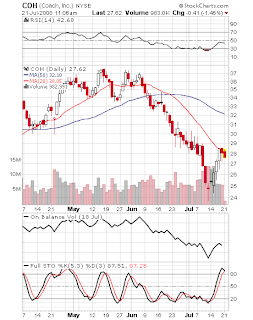 Poor OBV and overbought stochastic reading during what looks to be a short covering rally make this entry attractive. The stock seems to be failing at the 20 day MA. I will place my stop above the recent highs (above $29), with an initial target in the $24-25 range. You have seen me trade on this blog with amazing results. Now you can subscribe to my own personal trading journal, the MS Trade Report. This is the exact same journal I use to formulate my trading plan and execute trades. I scan thousands of charts on a weekly basis in search of only the best setups. Most of my trades come form the weekly watchlist. For those without the time to sift through thousands of stocks, this list is a life saver. Analysis of the major market indexes and ETFs using my own propietary indicators that analyze price, volume, breadth, pivot points and market extremes. Daily scans, filters and analysis of market sectors and industries. I provide an easy way to find out what’s hot and what’s not. Daily charts and setups of stocks on my watchlist. You will have a bird’s eye view of what I am looking for before I make a trade. I provide general tips on trading, setups, risk and trade management, along with important lessons I have learned as a swing trader. These unique ideas do not always form to conventional market wisdom, and are keys to my trading success. For $24.95 per month, you will receive 4-6 reports per week. My goal is to do everything in my power to offer a high quality service at an affordable cost.